Thanks to the Internet, comparison shopping has never been easier. And if you want to get the best deal for your dollar, the free Prices Drop Monitor (Mac App Store link) is a handy Mac utility that can help you out—assuming you do most of your shopping from Amazon. 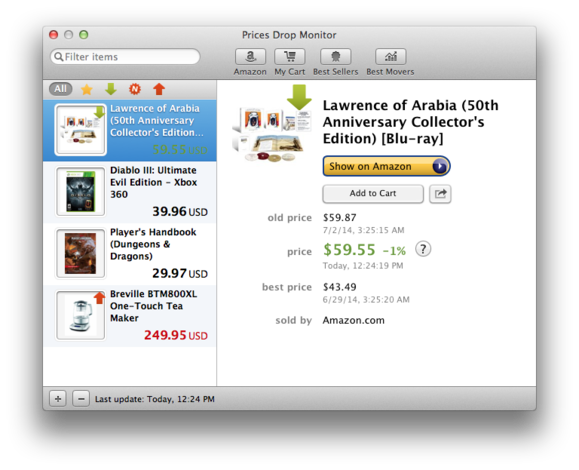 Prices Drop Monitor displays a little shopping cart in your menu bar; selecting Manage Items from it brings up the app’s main window, a list in which you can add items from Amazon whose prices you want to track. Click the plus button and paste in an Amazon URL to add an entry, or drag a URL from Safari onto the menu bar icon. The app then checks every 4, 8, 12, or 24 hours to see if the prices have changed, and notifies you. By default, the app badges its menu bar icon and turns it blue when there’s a change; you can also opt to be notified by Growl, Notification Center, a beep, or an email to a specific address. In the main window, the app shows you your items, and color codes them to show which ones have changed: green for down, red for up, black for steady. You can also quickly filter by a search query, or by which items are going up, going down, are new, or are recommended. You can track up to 20 products before you need to pay for the $4 upgrade that raises that limit to 50. As handy as the app is, it could benefit from a few additions, such as the ability to receive notifications only at a certain price threshold, integration with an Amazon Wish List, and perhaps even support for tracking purchases from sites other than Amazon.